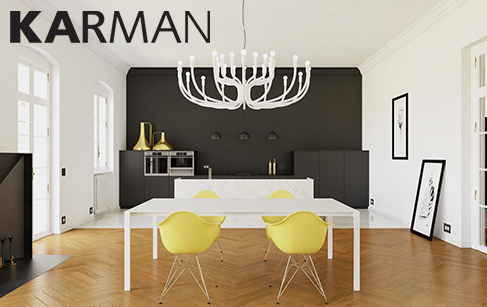 Karman is an Italian company, founded in 2005 in Fossombrone in the heart of the Marche region. It keeps experimenting with new unconventional materials and distributing its collections on a world scale. Experiment, dare, innovate. The Karman world moves itself with simplicity towards an original and personal decorative use of lighting in both private surroundings and public spaces. Every lamp has something to say. All Karman designers’ styles blend and coexist happily between tradition and modernity inspired by research and great technical skills to create beauty. All Karman products are made in Italy, with attention to detail and high quality guaranteed.